Short or medium of hard texture. Weatherproof, with good undercoat. Preferably straight. What is a correct coat for a Cardigan? The Cardigan has a fairly wide spectrum of acceptable coats however the coat should always be short to medium length and weather resistant. The Cardigan has a double coat, of firm texture and with slightly but noticeably longer hair on the neck, pants and tail. The correct coat will show an adequate ruff and trouser (rear of hindquarter) furnishings and a good tail brush. If furnishings are absent the coat is too short. If the coat is too soft, too open or if undercoat is not present it is incorrect. The primary function of the coat is to protect the dog from all elements of weather and enable it to effectively carry out the work for which it was originally bred, in the often cold, bleak and extremely wet weather conditions of rural Wales. The Cardigan's closely fitting double-coat is both water-repellant and insulating. Water tends to roll straight off the coat and even when the harsher outer coat is exposed to rain, the soft, dense undercoat remains warm and dry. 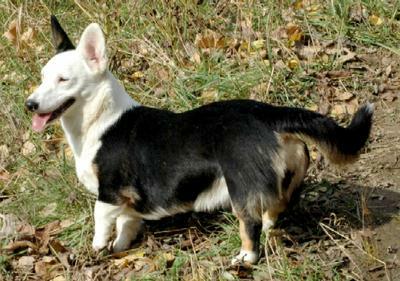 Too long a coat in a short legged breed picks up mud and dirt and is therefore undesirable and too much curl tends to give an open rather than a close coat. Incorrect coats of this type will lack weather resistance; therefore any tendency towards an open or very wavy coat should be discouraged. However, with a firm-textured coat as on the Cardigan, a very slight "wave" or marcelled appearance over the topline will sometimes appear and should not be unduly penalised. Extremely short coat (that which could be referred to as being of “the wet t-shirt look”. This coat is very faulty from a working point of view, as such a coat could not protect the dog against the kind of weather which it was bred to withstand. An extremely short coat provides neither the double coat for insulation, nor the length required for water resistance. 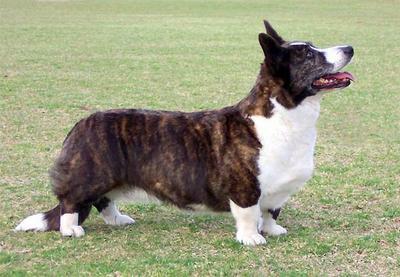 The furnishings on an extremely short-coated dog are minimal to non-existent and the tail will appear whippy and lacking in brush. Please note that a short coat is not the same as being out-of-coat. Even an out of coat dog will have some undercoat left -- though granted, not much! Open coat, usually of softer texture and greater length, which often stands out from the body at almost a 90 degree angle. This is faulty because it doesn't protect the undercoat and the body from weather. It is ironic to see a dog with a correct coat, but so over-groomed that it is shown with this incorrect open coat. Soft, silky coat, of various lengths, though usually longer, but again a coat which will not be weatherproof and will therefore lose its primary function – that of protection. 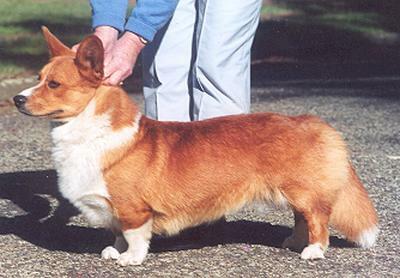 Fluffy coat, which is of greater length all over, often with a woolly texture (as differentiated from silky or harsh), fringes around and behind the ears, and lots of furnishings going down the backs of both the front and rear legs. 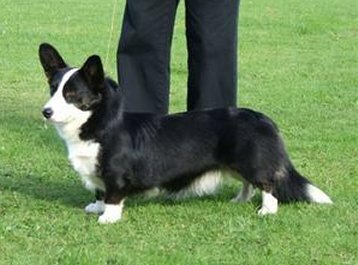 Fluffs can come with long, wispy coats sometimes with little undercoat or with longer undercoats showing through the guard hairs (reminding of a very bad Sheltie). A true fluff is unmistakable as anything else. Many people will never have seen one, and will have mistakenly identified the open coat as a fluff. While both are faulty, they are different faults. The term "glamour" coat is heard quite often and people may wonder what is meant by it. The problem is that there are widely individual interpretations of this type of coat and it is a term that often is misused for coats which are actually too full to be correct or borderline fluffs. Short-medium weatherproof coat which closely follows the contours of the body. 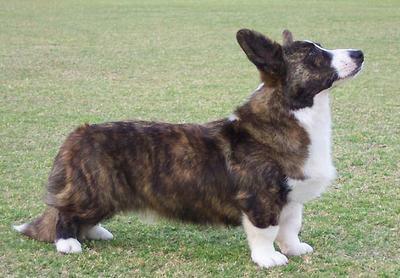 This coat has minimal furnishings on legs, a short, thick neck ruff and thick, tight tail brush. It is water-repellent and has a very dense undercoat. Short, hard and glossy weatherproof coat with minimal furnishings, but concealing dense undercoat. Also has a wave along the top. Note that this is slightly tighter (marcelled), which is what you would expect with a rougher texture to the coat Good tail brush. 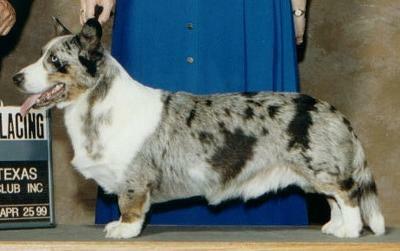 3a Another short-medium length coat with adequate furnishings and good tail brush. Weatherproof, tight and with good undercoat. Coat medium length and slightly softer and more luxuriant than those preceding but still acceptable and providing good protection from the elements. Medium length, firm textured coat with minimal furnishings, good undercoat and tail brush. Shows a slight wave in parts, which does not affect weatherproof qualities. 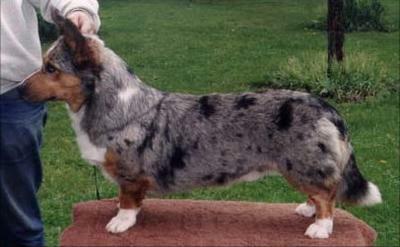 This blue merle male has a correct dense weatherproof coat. 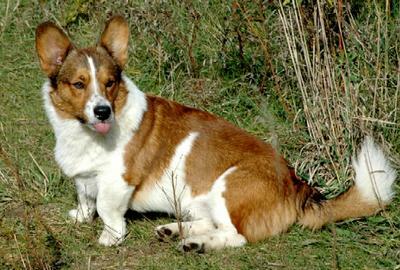 His double coat is medium in length and provides the proper texture with the outer hairs slightly harsh. The undercoat is softer and this coat is thick to insulate. His ruff has longer hairs but he could use more furnishings at the back of his thighs to create "pants". 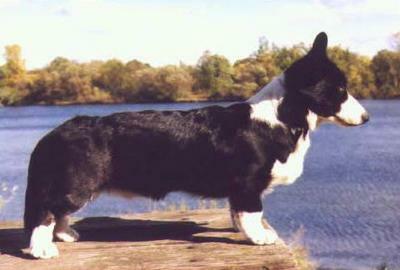 This dog's coat is slightly shorter than what would be favored, but has correct furnishings on the neck and backs of rear legs. Texture is slightly soft, but is still harsh enough to be weather resistant. Fit of coat over the withers merges smoothly into the body over a correct shoulder and the lines in the coat on the shoulder outline this structure. A good medium coat, with visibly harsh guard hairs. 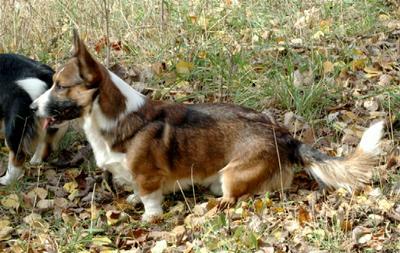 This dog has a medium length, double coat with correct furnishing on neck and back of rear legs. Texture is harsh without being wiry and it is weather resistant. There is some slight marcelling on the topline at the withers and over the tailset which are in part an inherited trait. 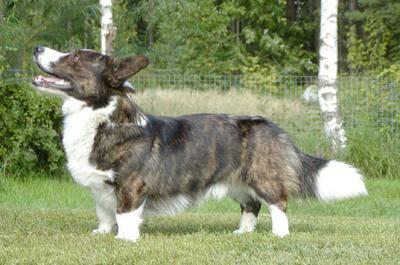 This dog also has a high natural tailset and carriage which causes the coat over the croup to develop a wave or curl. 16 month old brindle point tri, appears black and white but note small brindle areas on cheeks and legs. The collar is pulling the neck coat up which actually shows the longer and thicker hair at the ruff. The body coat is of medium length with adequate underbody furnishing and brush. 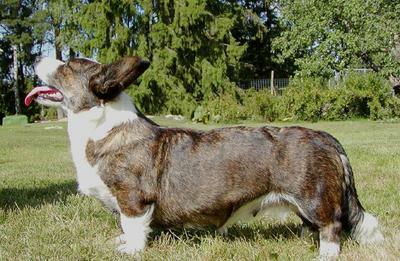 The correct double weather resistant coat of the Cardigan Welsh Corgi provides a soft undercoat for insulation, and a harsher outer coat to repel the elements of nature, rain, briars, etc. These pictorial examples are only meant to help visually, but one can only determine correct coat texture by evaluating with a thorough “hands on examination".